This machine does the same work as the Single Turning Machine but has greater output. The elevator mechanism is exactly the same as the single machine and the components are interchangeable. These elevator units are located in front of the tractor tracks and they discharge either into a cross conveyor, rubber belt type, or two return conveyors, rubber belt type, positioned over the tracks. The cross conveyor is reversible and moveable to either side of the machine. The tractor unit consists of a strong main frame mounted on caterpillar type tracks suitable for high idle travel speeds. It is powered by a standard diesel engine and transmission gearbox which is fitted with a proprietary clutch and brake steering equipment. A standard hydraulic pump is also built into this transmission and is used to operate the hydraulic lift of the elevators for idle travel. A special chain reduction drive is inserted between the half shaft of the standard tractor transmission and the track drive sprocket. The drive to the elevators and conveyors are taken off from the standard power take-off shaft of the transmission unit. 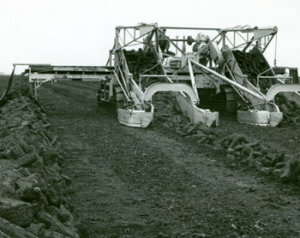 A machine with many different adaptations, the Sod Peat Bagger was essential for early production.